We’re trying a new style of beehive this year called a top-bar hive. It’s new to us and most American beekeepers but is actually a very old style. 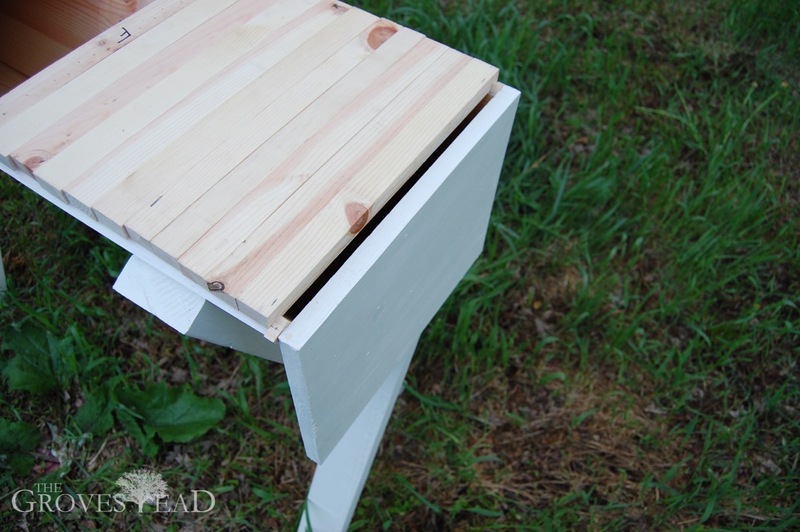 It predates the common Langstroth box-and-frame hives by many centuries and is common in many parts of the world. The main advantage is simplicity. 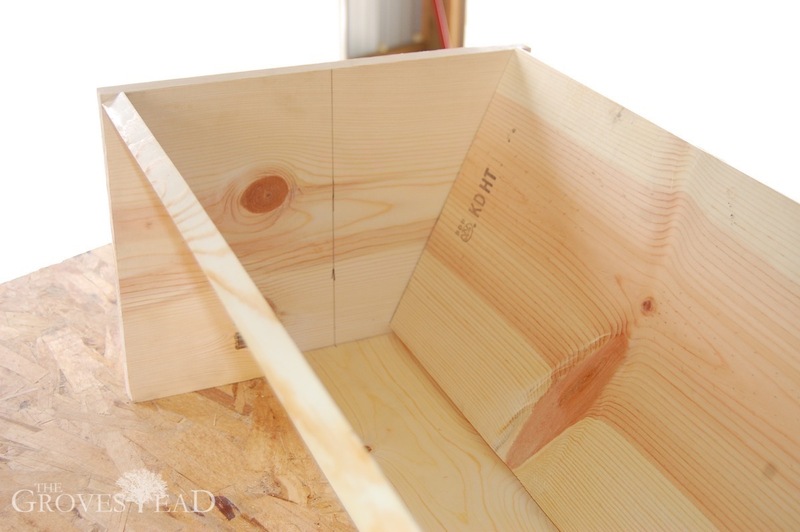 There are only two components: the trough and flat pieces of wood (bars) that rest along the top of the trough. There is no wax foundation, bottom board, feeder frames, entrance reducers, etc, which makes storage and cleaning much simpler. It is also makes much less expensive and easier to build. Whereas a starter setup for a Langstroth hive consisting of two deeps and a super can easily surpass $300 or take weeks to build from scratch, a top-bar hive can be built in a day for less than $50, and often less than that if you have scrap materials on hand. The main reason I wanted to build a top-bar hive was that I didn’t like how invasive the Langstroth hives were to maintain. It’s easy to inspect the top box of a Langstroth hive, but if you need to go any deeper, which you often do to find the brood, that means ripping apart an intact colony. Other beekeepers may not mind it, but I’m not so sure about the bees. After two consecutive total losses each season using Langstroth, I wanted to try something different. In a top-bar hive the box (or trough) is much longer, usually about 4 ft, and the bees build continuously in one horizontal run. Harvesting honey and inspecting brood can be done with minimal disruption. Check on the brood on one end of the hive, look for honey on the other. There are some drawbacks. Most harvesting equipment is designed for Langstroth frames so extracting honey at the end of the season will be more difficult. But at this point I just want healthy bees so I’m not so concerned about harvesting. 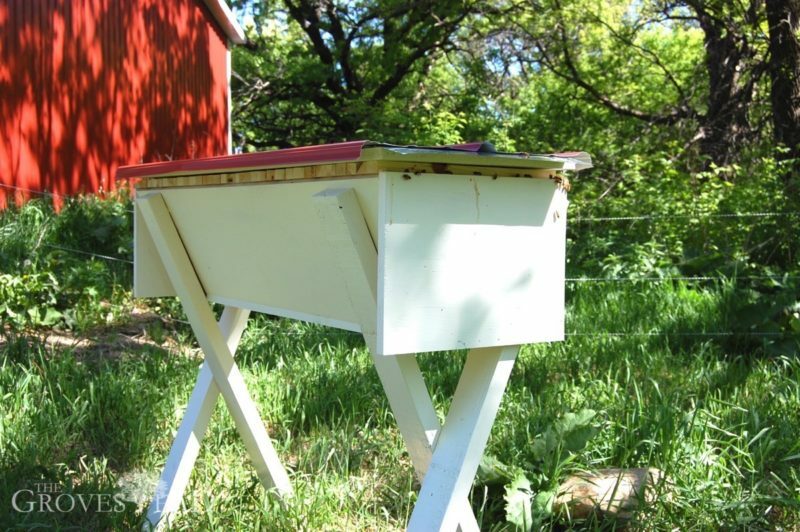 I based my design on the Kenyan Top Bar Hive. 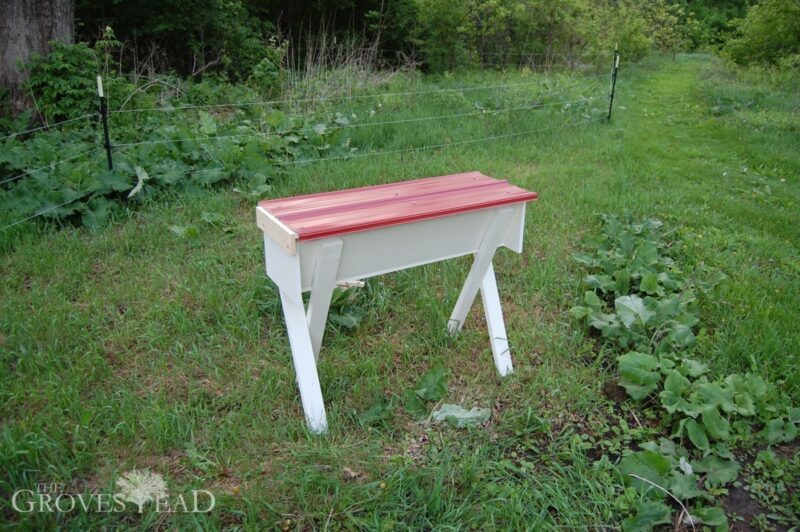 Expert beekeeper Michael Bush describes how to build one on his site. 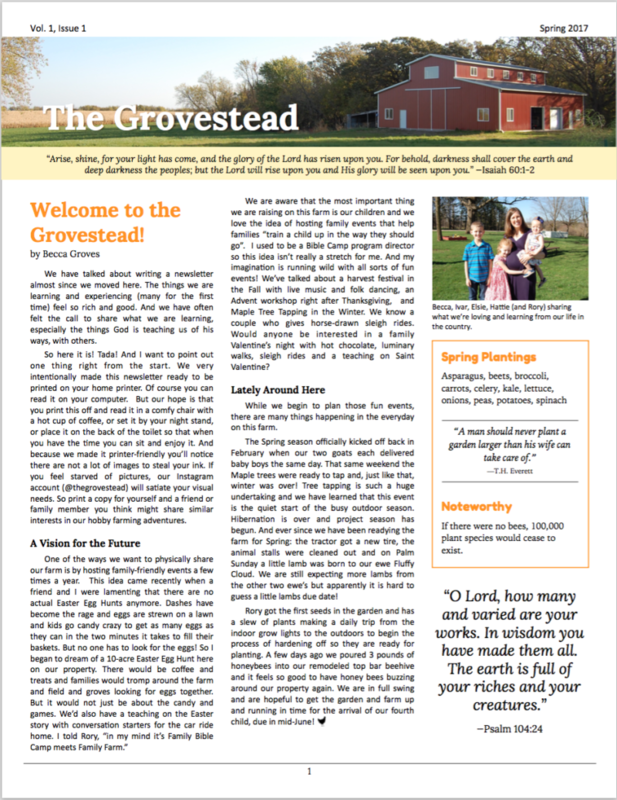 I highly recommend Bush’s website and books to anyone starting out beekeeping. His advice is rooted in practice and he has a lot of sage advice to share. (30+) bars cut 15″ by 1.5″ wide. Number of bars varies depending on how long your hive is. 48″ inside would require 32 bars. NOTE: Michael Bush suggests making both 1.25″ bars and 1.5″ bars, the former being better for brood and the latter being better suited to honey. In this case, you could cut 16 1.25″ bars and 18 1.5″ bars. 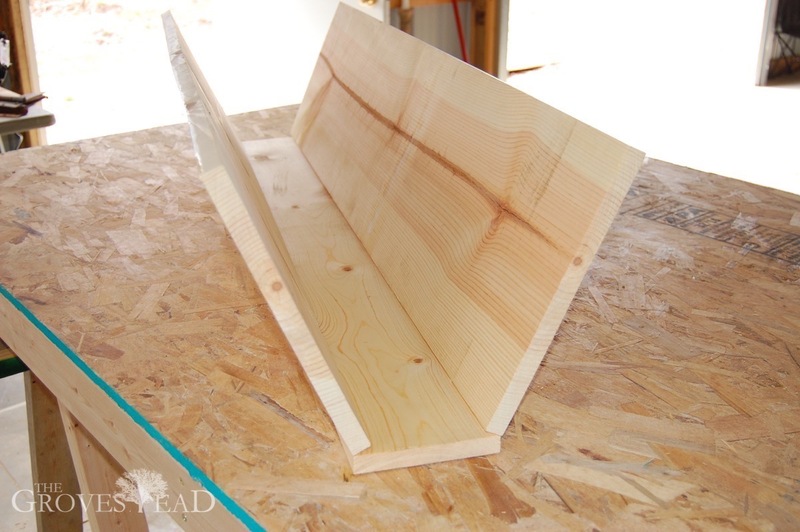 (30+) pieces of triangular corner moulding cut to 13″ to create a starting guide for the bees. 1. The first step is to decide how big of a hive you want to build. There is no required size, however most top-bar hives are around 4 feet. 2. 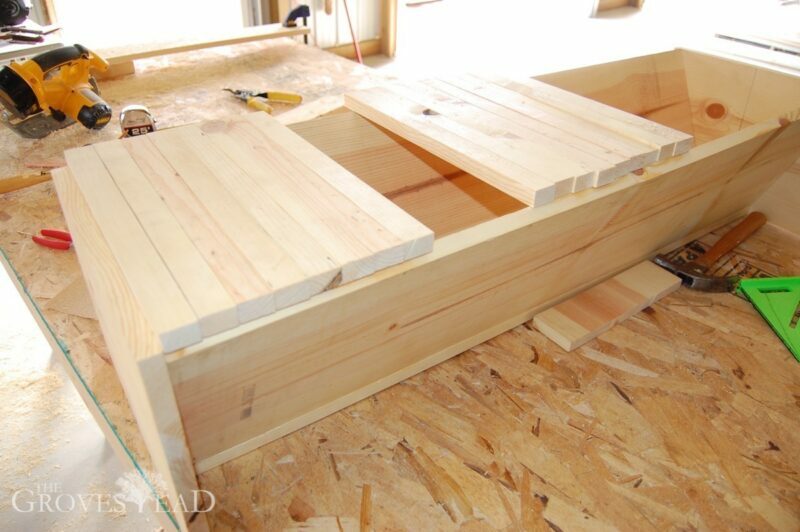 Use a finishing nail gun (or finishing nails) to mount the 1×12 pine boards to the inside top of the 1×6 bottom board. 3. Next, pry the 1×12’s outward until the tops are about 15″ across. 4. 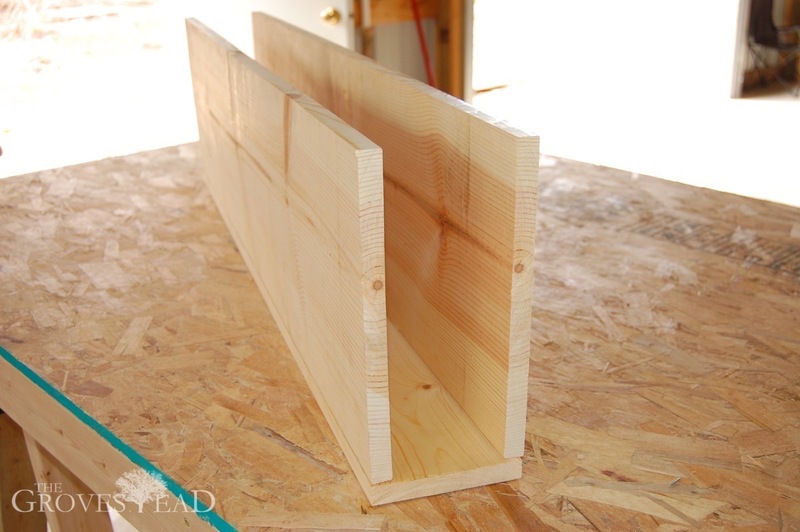 Nail the 1x12x15 end boards onto the ends of the 1×12 sides. 5. Next, make your bars. Decide how many of each bar you want to use (1.25″ or 1.5″) and cut. This was the only time-consuming part for me. Since I didn’t have a table saw, I had to re-measure each piece I cut, clamp on a guide and cut with my circular saw. 6. 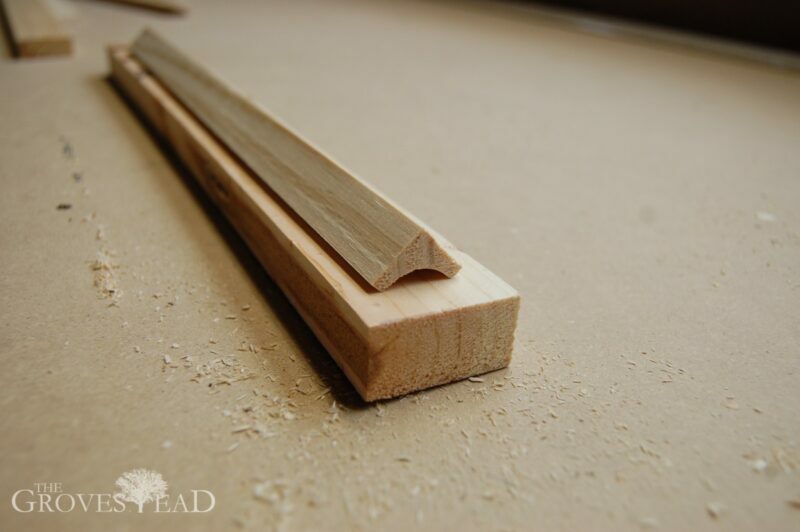 After you have your top bar pieces cut, it is highly recommended to add some triangular corner moulding (or you can make your own) so the bees have a guide on which to start their comb. 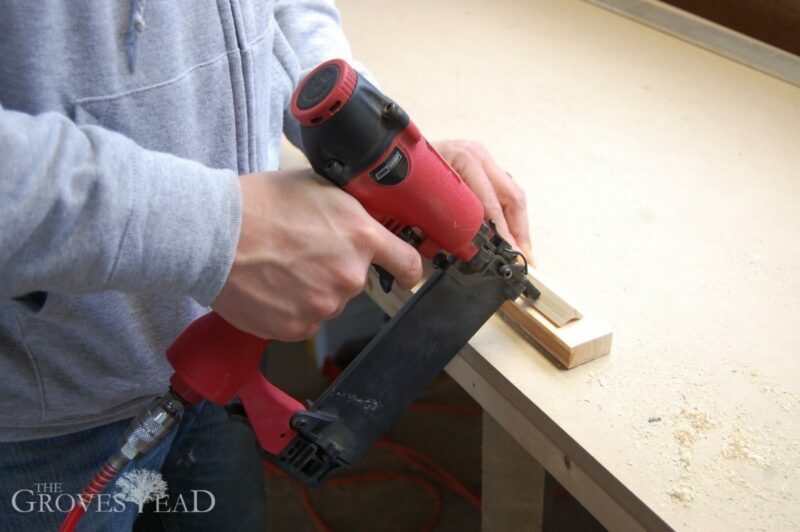 The guide will also act as a stopper to keep the bar from sliding out of place. Center the guide on the bar and nail or glue in place. 7. (optional) Create a “Follower” board to keep the bees contained to one side. Generally, bees prefer the smallest space necessary to build their hives. Using a Follower board, you can gradually expand the space available as needed, instead of starting them out in a cavernous box. 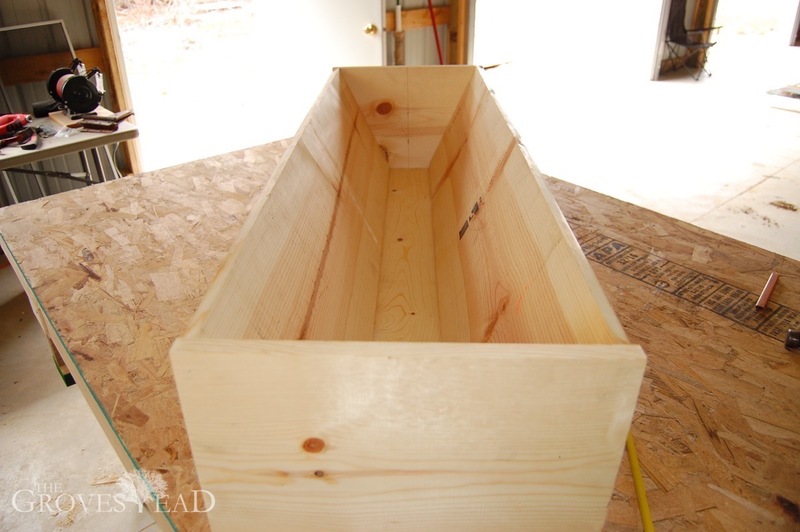 Cut a triangular piece of plywood or pine or whatever scrap wood you have left. The piece will need to be about 11″ tall, ~13″ wide at the top and ~4.5″ at the bottom. It does not need to be air-tight. Nail the board to the bottom of spare bar. My Follower board doubles as a food compartment. I drilled a 1″ hole near the bottom and keep a sugar water feeder just behind the Follower. This placement is ideal because its next to the brood chamber but inaccessible to robbers (other bees that come to steal honey and syrup). Also, since it is not a frame feeder, I don’t lose any bees to drowning. 8. (optional) I found it difficult to avoid smooshing bees every time I replaced the lid. As soon as bars are removed to inspect, bees crawl on top of the bars and its hard to get them all off before replacing the lid. I solved this problem by adding small strips of 3/8-inch wood on the underside corners of the lid. Now when I set the lid down there is only a small area where the bees might get crushed and its easy enough to keep clear. 9. The hive is now complete. Add 2×4 legs to desired hight, paint, add your lid and you’re ready to go! A note on entrances. I followed Bush’s advice and did not drill any holes in the sides of my TPH. Instead, I leave a 3/8-inch gap before placing my first bar. I actually nailed a 3/8″ spacer in front of the first bar so I don’t inadvertently close the entrance when removing the lid. The big advantage of a top entrance rather than a bottom one is that it 1) keeps out rodents and other predators and 2) provides better ventilation, as warm air naturally rises. 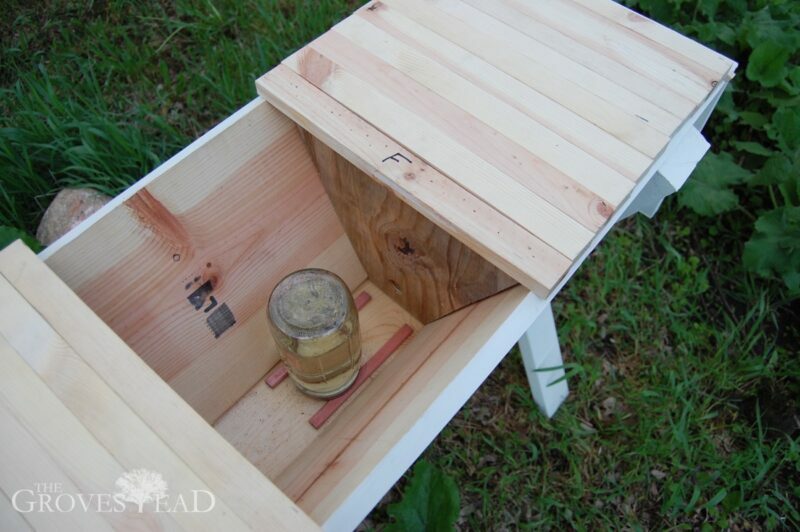 When the lid is placed over the bars it rests 1″ above the entrance and leaves a perfect gap for the bees to come and go. We welcomed the newest members of the Grovestead family to the farm this week, a nursing pair of goats! 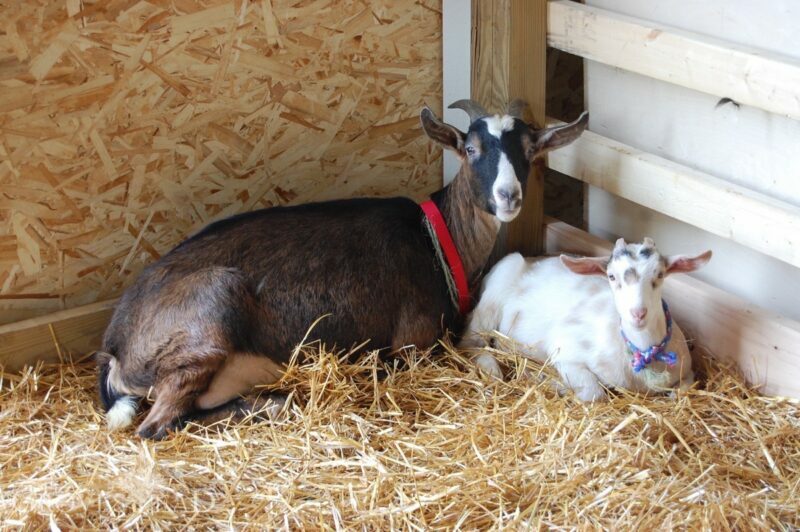 Mother and daughter (properly, nanny and kid) are settling in doing well. Ivar has named the kid Precious and there’s still an ongoing debate for the nanny. 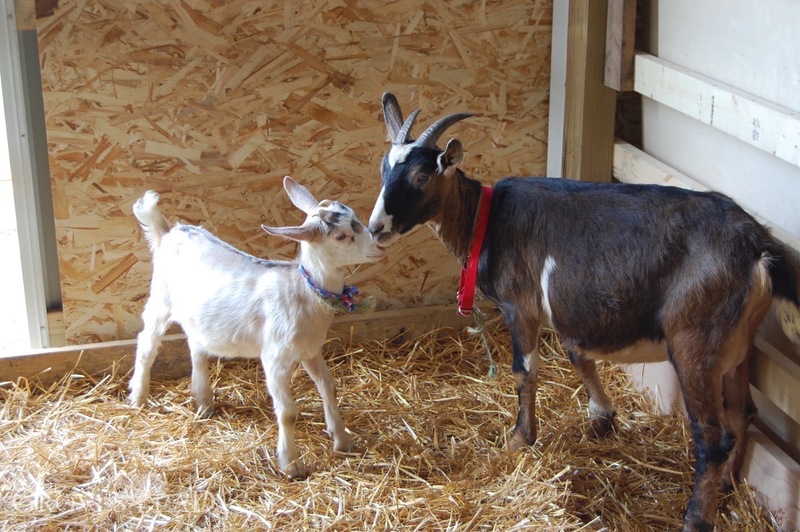 The goats’ arrival was a long time in coming. 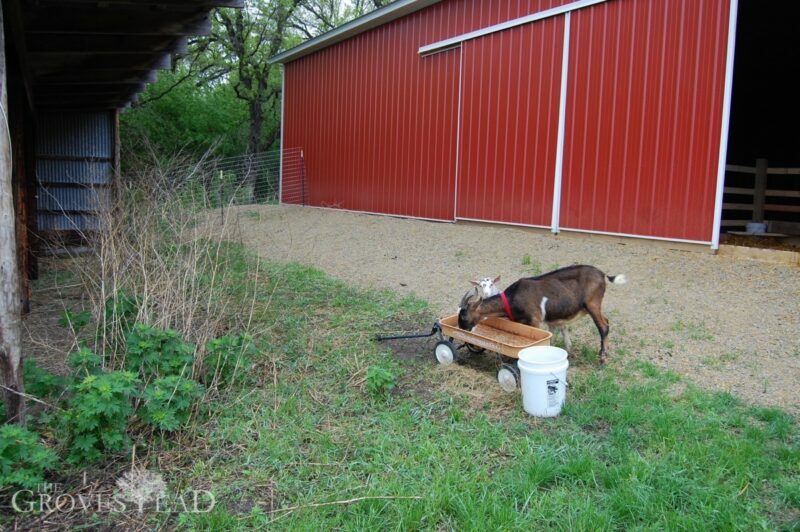 We had it in mind to bring goats in to clear the underbrush in our woods ever since moving here. 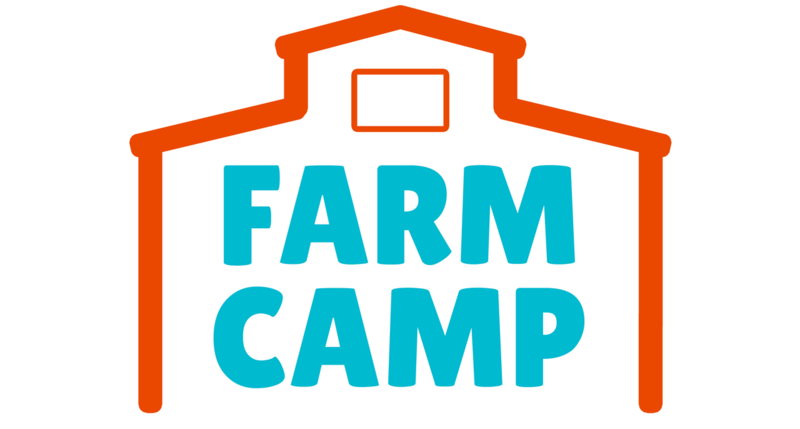 But we knew that was going to be a huge responsibility so we started small with chickens, bees and the obligatory farm cats. 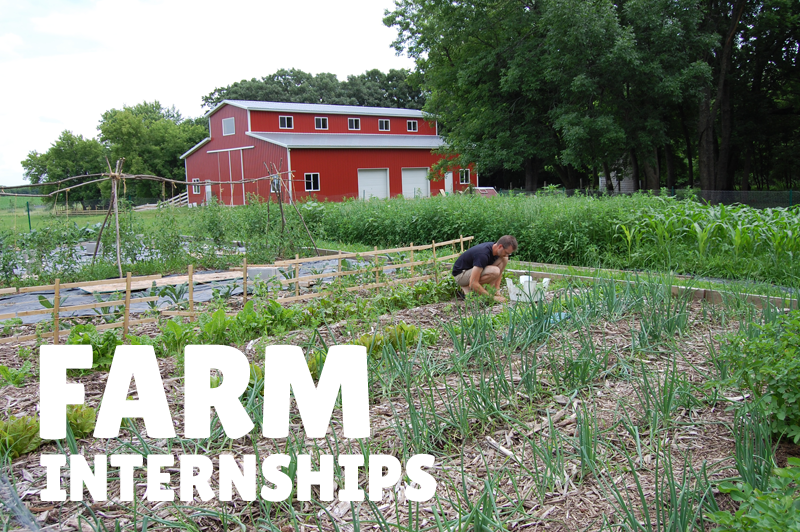 Last summer we tore down a collapsing shed and built a new barn in its place. Over the Winter I built stalls for animals. By Spring we were finally ready to welcome the new arrivals. 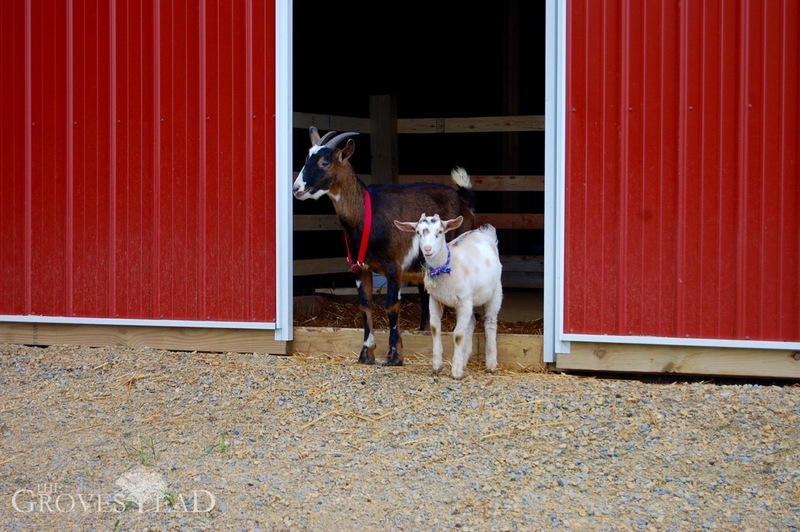 When I asked the breeder what breed of goats these were, she said “Heinz 57″. A little bit of everything. They are really sweet, though timid. Mother and kid are never more than a few paces apart. Other than the complete fiasco introducing them to the electric fence the first day, the experience has been uneventful. I let them out of the barn in the morning, and if it’s not raining they can forage for food all day. And the more they’re outside, the less litter for me to clean. Everybody wins. For now, we’re just letting them get used to their new surroundings. We have a small fenced-in run outside the barn. The next step will be to gradually start enlarging the fenced-in area, introducing them to more an more wooded land we want them to clear. All in all, it’s been a lot less work than I expected. Just make sure you have enough fence!